The new Wolves forward reportedly took about three dozen behind-the-scenes Bulls employees out for a long dinner as a way of saying thanks for their help over the years. 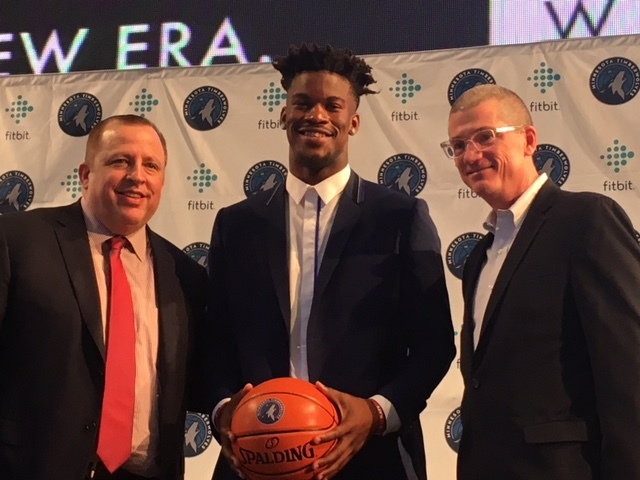 I have a limited working knowledge of new Timberwolves forward Jimmy Butler, but everything so far seems to indicate he’s a good guy. This story out of Chicago does nothing to change that opinion. Per the Chicago Tribune, Butler was in Chicago over the weekend for Dwyane Wade’s youth basketball camp and took about three dozen behind-the-scenes Bulls employees out for a long dinner as a way of saying thanks for their help over the years. Butler treated behind-the-scenes staffers like salespeople and media relations officials and digital production staffers at Katana, the chic new River North sushi restaurant. A basketball player making an eight-figure salary can surely afford to drop a few grand on dinner, but Butler certainly didn’t have to do this. At its core, the dinner seems like a thoughtful, kind gesture.